Wyoming is a state with a wealth of history, with rural areas and vast, wind-blown expanses. With that, the state breeds a vibrant antique culture maintaining the fleeting practices and products of the (bygone?) West. Wyoming’s circuit of antique stores do an excellent job of celebrating and sharing the shining relics of its region’s rich tradition. Here are our favorite stores in the state. For 20 years, Cayuse has held sway in Jackson, a competitive market with high maintenance clientele. Specifically, this gallery caters to Western Americana and Native American treasures. Originally an extension of owner Mary Schmitt’s home, the permanent location now rests in an out-of-the-way rural house. This shop’s collections embody the merging and collision of American and First Nation peoples, manifesting its namesake, drawn from the French pronunciation of the local tribe. This quaint building is crammed with antiques and nostalgic memorabilia, ranging from books to precious metals and jewelry. Not only are its owners and staff approachable and knowledgeable, the site hosts guest- and visiting craftsman setting-up temporary shop, bringing both specificity and eclecticism. Amongst Cheyenne’s many antique shops, the Elephant certainly holds its own. Herman’s humble space exhibits its roots as an antique furniture restoration business. Growing into a 6,000-square-foot space, the collection has expanded from simple examples of gorgeous rockers and tables, to the rooms within which these pieces fit (with the items found therein). From the pots and pans of a century-old kitchen to the gas lamps of a dreary cobblestoned alley, this antique store provides a great well-rounded pick. The charmingly aged brick building, formerly the local creamery, is an immediate reassurance of the fascinating knick-knacks and nostalgia contained within. For over 20 years, the store has amassed three stories worth of memories almost overwhelming to the eye. Each glance is packed with history: Ornate Victorian mirrors reflect rows of dolls, kitchen items and decor, while another look reveals hidden jewelry and a starscapes’s-worth of tchotchkes. This shop is attractive in its tinge of retro: Not antique, but comfortably-recognizable and similarly worthwhile (i.e. pinball machines). This may be a turn-off to some, and a draw for others. But any casual visitor or experienced picker will surely find something of value. This organized, clean store has a uniquely diverse collection: Furniture to toys, tools to clothing, signs to stickers. It may not have the oldest items, but they definitely run the gamut. The Rusty Cotton Co. effectively merges the modern, hipster proclivity towards shabby-chic with a love and respect for Western Americana. One is as likely to see a century-old wagon, the rusted wheels still supporting a splintering and warped frame, as a retro-styled cowboy dress, modern in its nostalgic silhouette and ancient in its construction. Don’t feel guilty if shopping for the truly antique leads to a foray into the shabby-chic. Bart’s website boasts that they’ve “anything you need or want…(almost).” And, surprisingly enough, it may just be true. 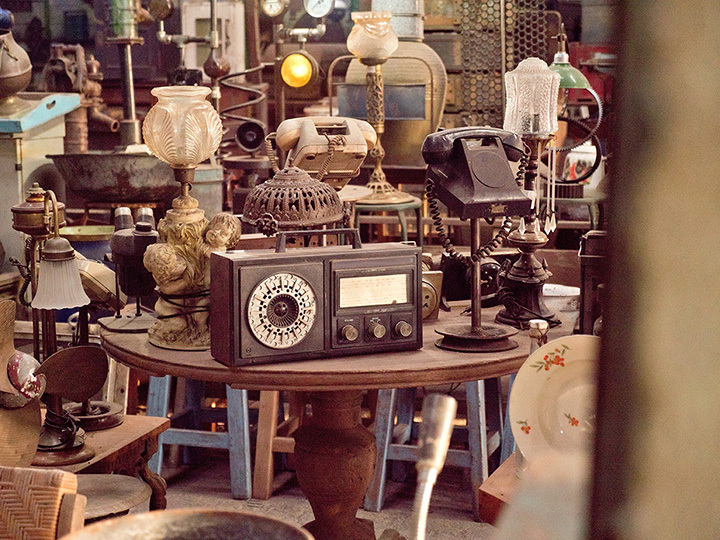 Though certainly more a flea market and swap meet, amidst the milieu are a wealth of antique treasures. Look past the used appliances, and apparel from all eras, and there’s likely to be 100-year-old oak table, or some hand-painted porcelain from the turn of the 20th. One may have to dig through this warehouse of goods, but digging is sorta the point, right?